[New for 2016] Time for a product that has so-so availability but also potential cross contamination with peanuts, almonds and cashews. That means I have to wait and grab it as a lunchtime snack instead of bringing it home. Whoa, that's so tiny! I can't forget that these are only 150 calories a treat. It does smell good though! It's like chocolate with a hint of strawberry. Dove chocolate is always a winner. and without even trying, I inhaled the bar in four bites. Ok, it was probably 5 or 6, but you get the idea. I don't think I really savored any particular part in this first run, but it did leave me with a question which is: Do I really want these two items mixed? Technically those fruit dips did grow on me, but their thin form factor is a bit more geared towards savoring. These treats are thick with a tasty chocolate shell that breaks easily. I can't savor it when I'm worried about it falling on the floor. If you are curious, it feels more like sherbet than sorbet. 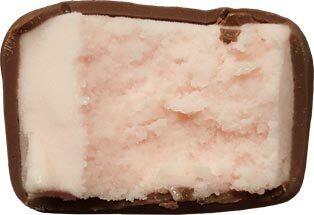 It's also very light so it doesn't have any trouble conveying that tart strawberry pop in every bite. The soft texture means it has trouble supporting that thick (and tasty) chocolate shell. As I sit here thinking about my next bar, I can't help but wonder if maybe I should eat the shell first and then the chocolate (though I kind of wish i chase the sorbet with the chocolate instead). On Second Scoop: And bar #2 is in my belly. This treat is definitely growing on me. It's bright, it's bold, and it's always fun to crunch a quality, milk chocolate shell. If these catch your interest, I say go for it. For me, I will quantify my critique this way. These are only a 150 calories so you could argue that eating a second would be ok, but I didn't. I don't know if one was satisfying enough or if two just wouldn't cure the hunger which has been pestering me all day. >>> Third one was even better for me personally, I knew these would grow on me, even if they are small. 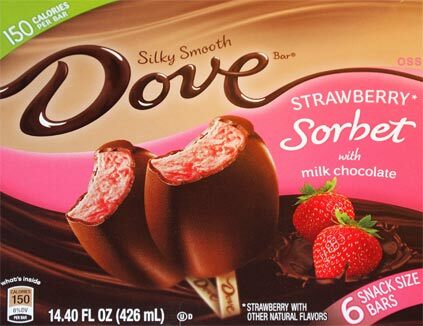 We need more lower calories bars like this from companies who make premium and super premium ice creams for those of us who don't want to spend a lot of calories on junk food. I love this idea and hope more companies get on board with the idea. I thought these were good, but a bit on the sweet side for me. Speaking of lower calorie options have you found any of the new Halo Top flavors to review? @uber: cool. at some point I will pick them up but it'll probably be a while.